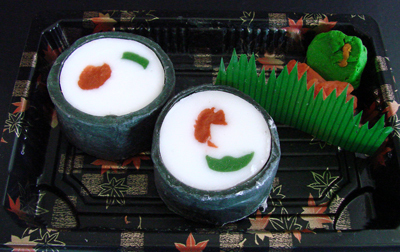 Isn’t this Sushi Soap made by Teresa at The Two Tadpoles clever? I squealed with delight when I got her creative care package in the mail. Everything is soap, even the Wasabi! She packages up everything smartly, with a finishing touch of chopsticks on top. For $20, you could have your own Sushi Soap set. Teresa shows more details of the soap and how she packaged the set on her other blog Demeter’s Dance. Gift season is almost here. This would be the perfect present for the Sushi Fan in your life. That is so beautiful looking!!!!!! That is very nice. The packaging she does is great. Heather, who doesn’t need a Sushi soap set? It is very cute in person. My 12 year old thinks he NEEDS it!! 🙂 He may be right! Teresa & her Tadpoles are very talented! I ordered some wonderful Halloween soaps for my granddaughters and they were a BIG hit! Oh my goodness, Anne-Marie, I about fell off my chair when I came to your blog and saw this! Thank you so very much for the shout-out, and thank you for the delectable Wasabi fragrance! !